Did you know that there are three different types of people who regularly see identical twins? Identical twins, their friends and family, and people with double vision! 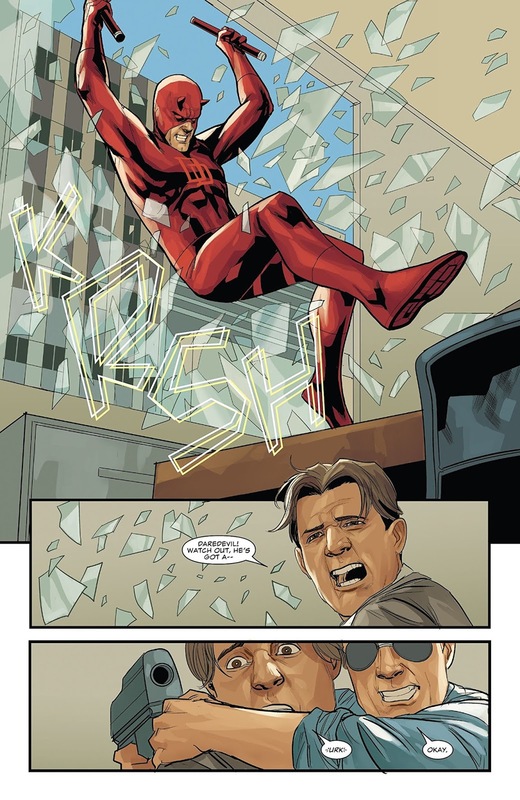 Who, coincidently, feature in the following adventure created by Charles Soule, Phil Noto, and published by Marvel Comics in October, 2018. TO QUOTE King Solomon: 'A friend loveth at all times, and a brother is born for adversity'. 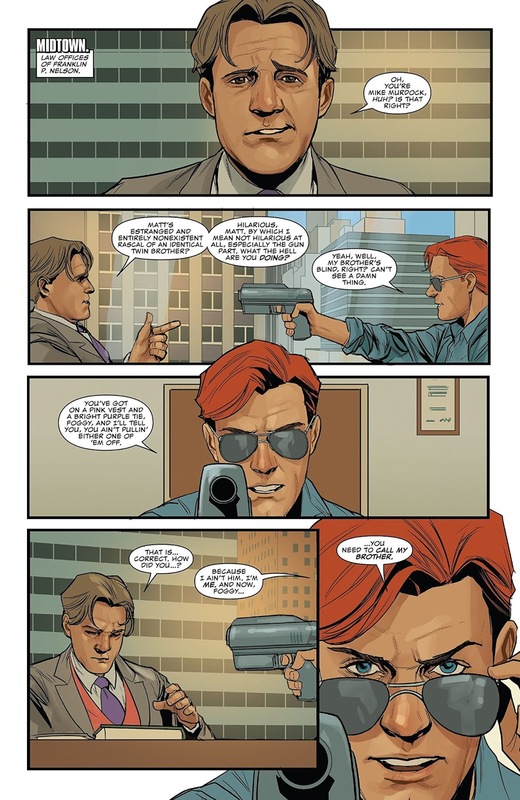 In a last-ditch attempt to reach out to his estranged twin-brother, Matt Murdock, Mike Murdock brashly kidnaps his old friend, Foggy Nelson, in order to draw them both together. Part One) BROTHERS: Do you have a brother? I do. Two of them in fact, and overall the three of us get along pretty damn well. In fact, we get along so damn well, we can’t help but get confused considering we’re nothing alike. Come to think of it, though, that’s most probably why we all click! It’s because we each understand that we’re all different people and have our own distinct personalities and ways of thinking. For instance, my older brother loves sport and looking after himself (so he's really healthy); my younger brother loves cooking, baking, and drinking (so he's really into his food); and as for me? I’ve got my love of comic books and old movies, and through this, I suppose I have a better understanding about the construction of a story and judging it by its own merits. Well, just take a look at this one, for instance, issue 608, which, coincidentally, is about brothers. 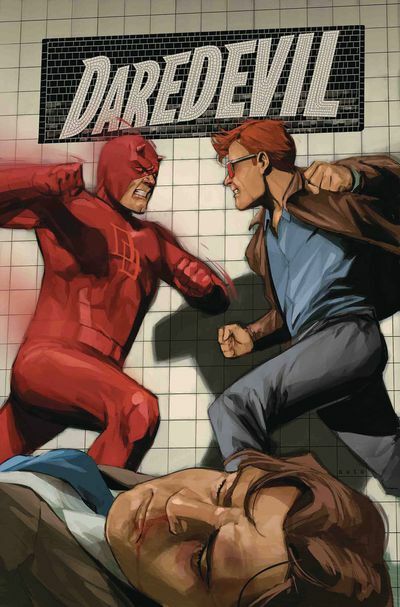 Two brothers to be more precise: With one of them being a blind lawyer, who masquerades as a costumed crime-fighter, named Matt Murdock, otherwise known as Daredevil, while the other is a younger, newer, and less blind version off Matt, named Mike, who seemingly has no soul. Yes. That’s correct. I said he has no soul. No soul at all, and to make matters even worse, Mike wants to be close to Matt, so he attempts to do this by kidnapping his best friend Foggy and then holding him to ransom. Silly, I know, but then again, this is a silly story, a very silly story indeed, especially when you take into consideration that when Matt eventually catches up to them both, hoping to settle the score, for some unexplained reason he suddenly has a change of heart and allows his elusive sibling to get away. But why? Why would Matt allow Mike to escape when he knows that he isn’t completely stable, given his recent actions? I mean, not only is it silly, but it’s also very dangerous too. It's dangerous to allow your soulless duplicate to mingle with the general public, regardless of any fictitious familial bond! Part Two) FUN BY DESIGN: ...overall I thought this adventure was a pretty decent read. For a start, I just loved looking at Phil Noto’s artwork, as it’s the type of artwork that’s fun, bubbly, and expressive on the page, without forgetting to mention very clean and easy to follow. Go on, just take a look at some of the pictures provided and you can clearly see how good he really is. His characters are well defined and full of emotion. The way he paces each scene is very fluid and skillful by design. Plus let's not forget that Phil does his own coloring in, folks, doing so with a muted, almost sterile, color palette, which accentuates what he has already drawn. Along similar lines, I would also like to applaud the very enjoyable way this adventure eventually came to a close. Well, without giving too much away, let me just say that in the final few pages, we, the audience, see someone approach, and then become approached, by two notable Daredevil adversaries, with each one sealing an elusive deal which I can’t wait to see more of. Seriously, folks, it almost feels like the next few months will be one hell of a rollercoaster ride full of ups, downs, twists, and turns, with the first turn starting right here, right now, with coff-coff making a deal with wink-wink. Say no more. I also liked the fact that Frank and Reader were given some more time to flesh out their personalities and style. For Frank, it showed that he's a disciplined man who’s always willing to follow orders, whereas in Reader's case, it showed that he’s not, no, not at all, which may be an interesting development to follow sometime soon! Out of curiosity, what did you think of this episode? Did you like it? Did you hate it? Or like me, are you sitting on the fence with the hope to find out more? At a guess, I think Matt’s team will suffer some casualties in the near future, and in turn, this will provoke Daredevil to do something rather rash and rather overt! Will he kill someone? No. I don’t think he’d do that. But what I think he may do instead is... no... I best not go there. Not yet, anyway. Although I may do next month! So, all in all, I felt that this was a pretty fine issue of Daredevil with great art, a simple story, yet was lacking something special to make it stand out and become very memorable. Now if you want to know why I’m musically matching up this episode to the Bee Gees song, ‘Gotta Get a Message to You’, then I suggest that you read the following section. Many thanks. If you think about it, fellow Daredevil fans, the majority of this story was focused on one family member trying to reach out to another family member. Although, in this case, instead of sending them a letter, they’d rather draw their attention by kidnapping one of their friends! 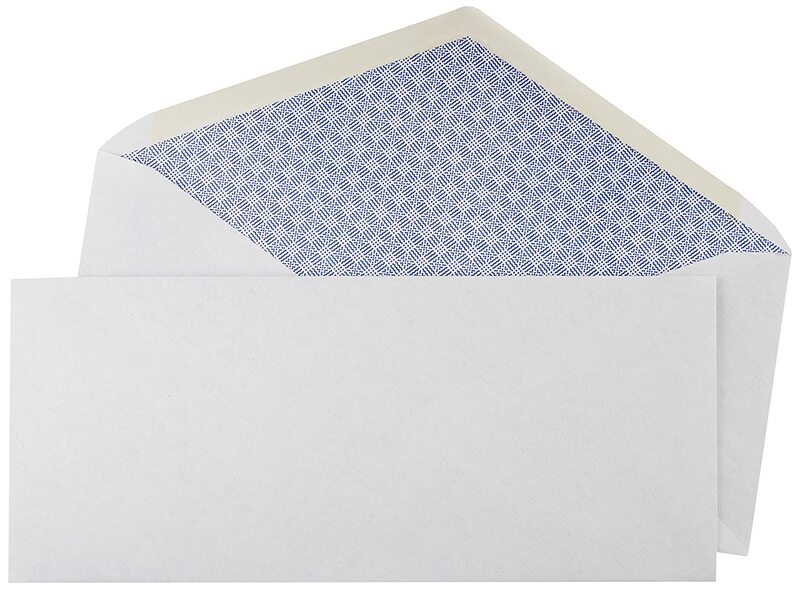 So that is why I’m now going to compare this comic book to — yes, you guessed it — a letter, or some other means of formal invitation. The Man Who Does That Thing With His Thing.